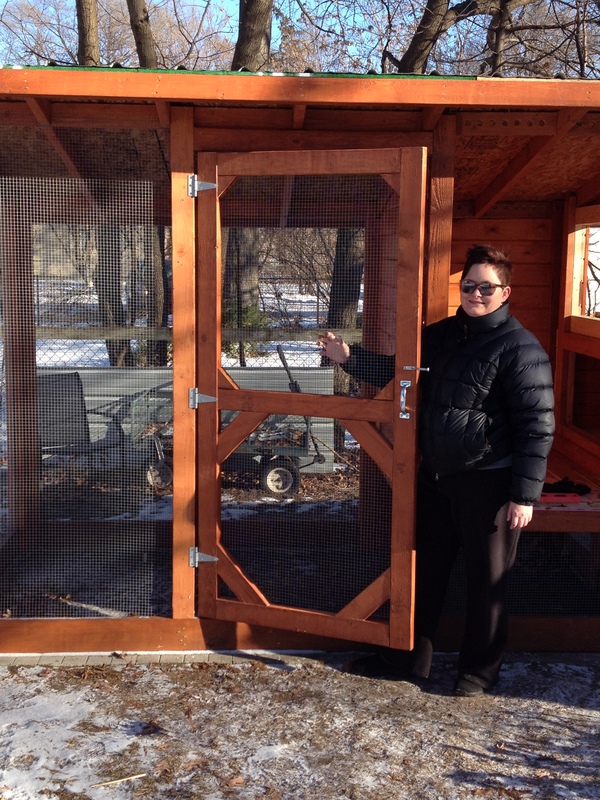 Jilli and the seriously awesome chicken coop door. It’s rock ‘n’roll, baby. So we installed the door. I’m impossibly excited about it. Matt installs the door. Yes. We now have a door!! It looks awesome. I mean, we had an idea it would look good, but now that it’s in place, it just looks so official. We really have a chicken coop in our yard!! The install only took about 10 minutes. We already had screwed one side of the hinges onto the door. So we used paint sticks as spacers on the bottom of the door (to create a level gap), then screwed the other side of the hinges to the coop. Then we installed a simple door latch that I bought at Home Depot. Right away, it worked like a charm. It caught the latch, and locked the door tight. Of course there’s a catch. I chose a door latch that works great closing/locking the door *from the outside*. But if I’m inside the coop and the door closes, I’m locked inside. Brilliant move, Jillian. 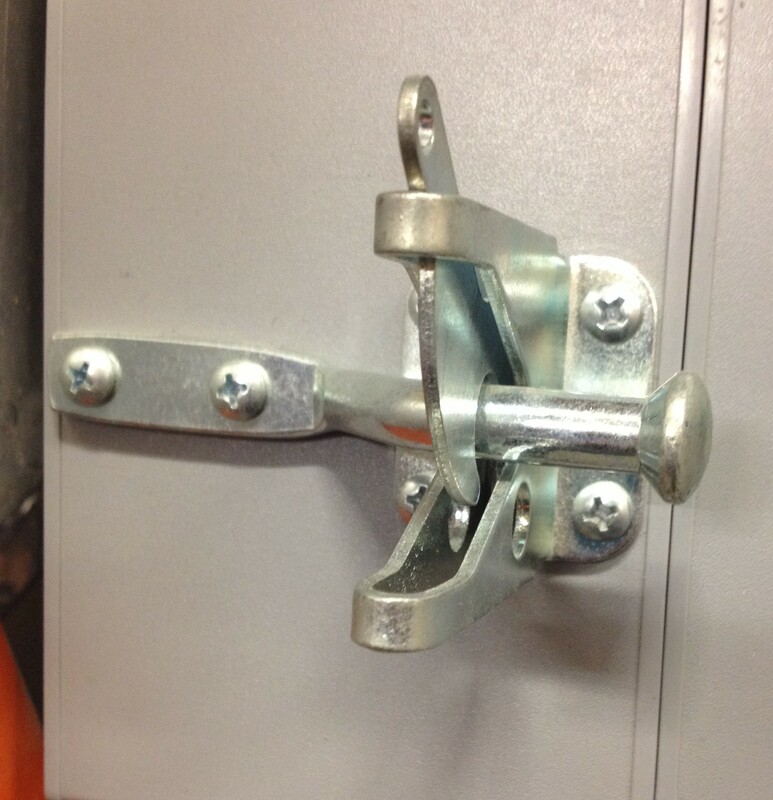 This is the latch we used (on display at Home Depot). This development has given me great anxiety. I imagine myself locked inside the coop with a blizzard bearing down, no way to escape except to destroy the great handiwork we’ve put into it. Sigh. Sensing my distress, Matt offered to install a string pulley system that would allow me to unlock the latch from inside the coop. What a guy. Seriously. So now, all that’s left before inspection is the hen house door. We’ve saved the hardest task for last. But I’m hoping that we’ve created enough momentum to bust through our hesitation. 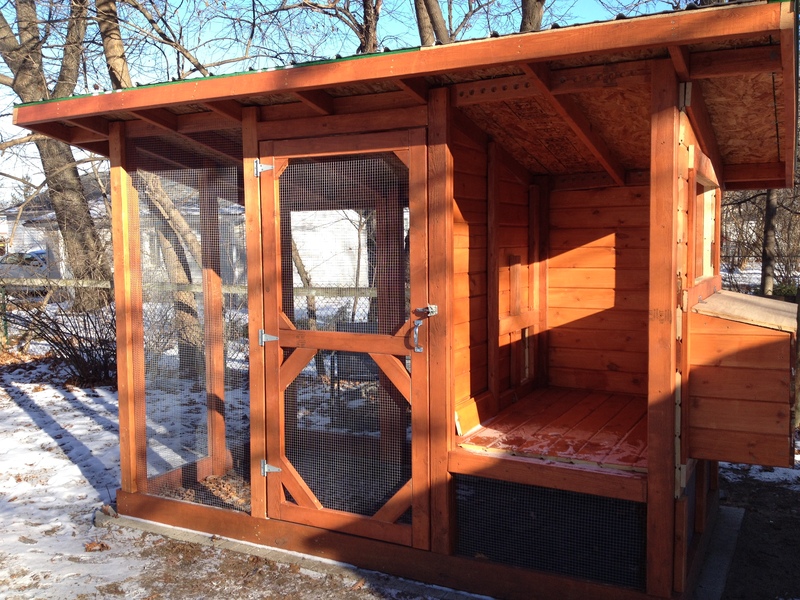 My goal was to have the coop ready by the end of December. I’m not quite sure that’s gonna happen. But I have to say I am glad we managed to get so close. Yes. This is a victory. This is what the coop looks like now.